Sentinel is one another advanced tool by Zerodha for their users. It is a platform that allows users to create real-time price alerts and recieve notification via mobile/email whenever the underlying hits the set price. Although most of the stock brokers have the inbuilt feature of alert notification based on last traded price that run on machine. If the machine is off or logged out of the trading platform, the alerts don’t work – which is exactly when users need the alerts. 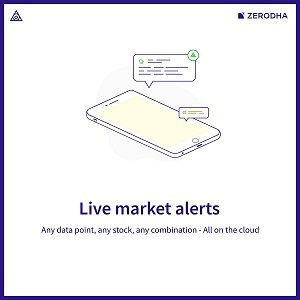 What difference zerodha sentinel from them is, it is a cloud based system that notifies even the trading platform is logged out. Users can create basic alerts based on attributes such as price, trade quantity, volume and open interest and also script advanced triggers by using combinations of attributes (including arithmetic) and operators. How to set an alert? After providing relevent values in trigger form, Finally you just name the trigger and click save. Your trigger is saved in "My Triggers". You have the option to pause, edit & delete the trigger from the list. Users can combine multiple triggers to create advanced alerts using Sentinel Trigger Language (STL). Creating complex triggers is as easy as writing a formula in Excel. Sentinal comes with 3 Trigger packages for all users. (a) Sentinel - Free; (b) Sentinel - Plus; and (c) Sentinel - Pro. Trigger Packs selected by you shall be applicable for periods selected. ‘Auto-renew’ option is available and the charges due and payable as per the Trigger Pack and as per the period selected shall be automatically debited by Zerodha from the user’s demat and trading account ledger.